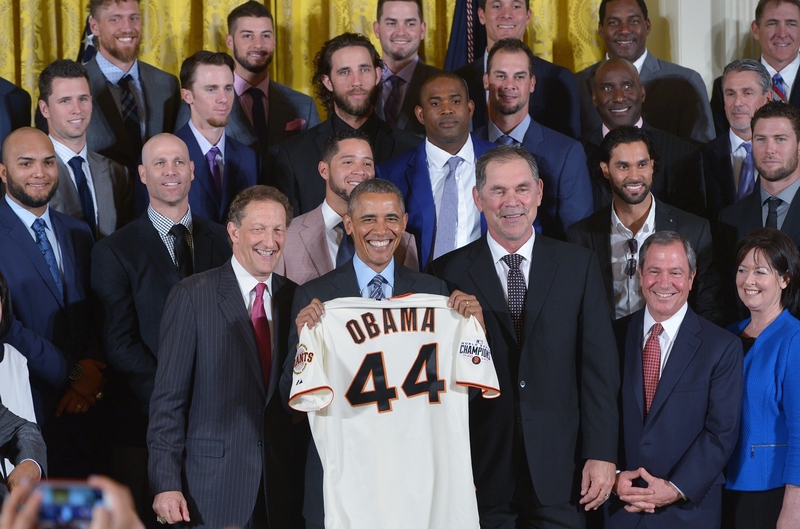 President Obama welcomed the reigning World Series champions, the San Francisco Giants, to the White House on Thursday, congratulating the team on making the playoffs and lauding them for their contributions to the greater San Francisco area. The Giants are the first National League team in 70 years to win three titles in five years -- they also won the World Series in 2010 and 2012. "They've got that championship experience. I seem to be good luck for them," Mr. Obama said. "And I guess they do have one other thing - Madison Bumgarner." Just 25-years-old, Bumgarner has already earned the title of being one of the best pitchers in postseason history. The president praised his record, noting, "For his career, he's 4-0 with a 0.25 ERA in the World Series." Last season, Bumgarner set a new record for postseason innings pitched. The president shared highlights of other star players, including Hunter Pence, veteran All-Star Tim Hudson and Yusmeiro Petit, who set a world league record retiring 46 consecutive batters during his season. Hall of Famers Monte Irvin and the "Say Hey Kid," Willie Mays, attended the event. At the event, Mr. Obama also announced a multi-million dollar project Giants Community Fund is teaming up with San Francisco State University and Major League Baseball to build a Junior Giants Urban Youth Academy. With the aim of targeting boys and girls from underserved areas of San Francisco, the Academy will include mentoring, tutoring and college prep programming. "It's the kind of initiative that fits right in with the goals of our My Brother's Keeper initiative to keep all of our young people out of trouble and give them the opportunity to stretch as far as their dreams will take them," the president said. "And it builds on the work that Major League Baseball is already doing to lift up young people in communities like Compton and New Orleans, and right here in Washington, D.C."